Naughty or nice, everyone can have 2017 Topps GPK Wacky Packages Holiday cards! Garbage Pail Kids and Wacky Packages combine for a festive online exclusive set. 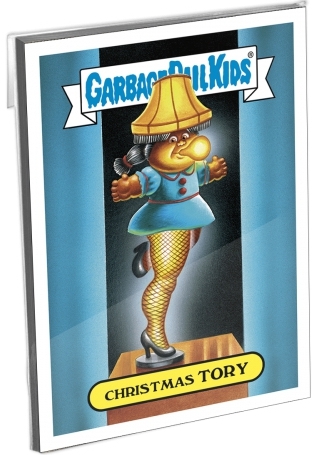 2017 Topps GPK Wacky Packages Holiday showcases subjects from movies and television shows, including the infamous leg lamp from A Christmas Story, as well as seasonal favorites Rudolph and Frosty the Snowman. Popular brands such as Elf on the Shelf, Mentos, Norelco and Pringles also receive the satirical treatment. Available as a complete set for $34.99, 2017 Topps GPK Wacky Packages Holiday contains 10 Garbage Pail Kids (A and B title cards) and five Wacky Packages stickers. Collectors have just one week to purchase the 15-card on-demand set via the Topps Online Store. After the sales window closes on December 22, final print runs are announced. 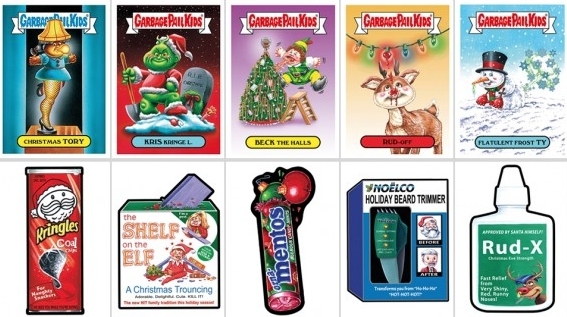 Shop for GPK Wacky Packages Holiday Sets at Topps.